In the Kanji characters used in both Chinese and Japanese, "crisis" is written with two symbols, the first meaning "danger," the second "opportunity." By facing and removing the danger of the climate crisis, we have the opportunity to gain the moral authority and vision to vastly increase our own capacity to solve other crises that have been too long ignored. 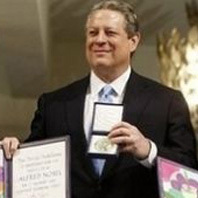 Faithful readers will recall that Gore has relied on this canard about the Chinese word wēijī on numerous occasions, such as a Vanity Fair article in May 2006 and congressional testimony last March. I'll point again to Victor Mair's careful debunking on Pinyin.info, though the trope is so firmly implanted in the rhetoric of Gore and other political figures that debunkage is rather beside the point. As I explained here, the wēijī story was first traded among Christian missionaries in China as early as 1938 and made its way stateside by 1940, later to be popularized by John Foster Dulles and John Kennedy, among others. Last time around I wrote, "After nearly seven decades of increasingly hackneyed use, isn't it time to retire poor overworked wēijī?" Apparently not quite yet.